Arthcare is an absolute solution to any type of musculoskeletal disorders, pains and aches that happens due to arthritis, osteoarthritis and rheumatoid arthritis. This is considered as one of the best pain-relieving products from the house of Morpheme remedies. The product is the outcome of some of the finest herbs that works as an anti-inflammatory. Arthritis can be painful and patients suffering from any sort of arthritis looks for immediate relief. They get accustomed to daily medications and that brings in an imbalance in their life. Arthcare capsules helps people suffering from any type of musculoskeletal disorder, pains or aches caused by arthritis. It is useful in ankylosing spondylitis or other arthritic pains. Due to its anti-inflammatory property, this capsule helps in providing fast relief from pain. It helps lessening sciatica pains and this easily available capsule works wonders in any sort of pains. Joint aches and arthritis are common problems. This is a complete herbal solution and is composed of vegetable cellulose. The product does not contain dairy products, allergens, binders, yeast, artificial colors, fillers, sugar or salt. Arthritis pain is possibly the most painful ailment in the world. The pain is so terrible that it restricts any kind of movements. All types of activities are stopped, as the patients are unable to move joints. Arthritis can be gruesome and the effect on the joints is awful. Using the arthcare capsule not only helps to mitigate the pain but also provides strength to these joints. The capsule helps in working on joints, ligaments, bones and all other attributes of any joints. Arthritis is a common ailment and has various options that can provide temporary cure. Operation is expensive. It involves a lot of cost and an inhuman pain post surgery. Another option is injection. That too is exceedingly painful. Going for regular medication can make the body so accustomed that later on it cannot do without the medication at all. The only safe remedy can be herbal assistance. It not only helps in fighting severe pain but also works from within to fight the cause of such musculoskeletal disorders, pains and aches that happens due to arthritis, osteoarthritis and rheumatoid arthritis. The composition of Arthcare is done by blending some of the finest herbs that are available. Commiphora Mukul (guggul): This short shrub is used for decreased cholesterol synthesis in liver. Pluchea Lanceolata (rasna): This is a genus of a flowering plant. It aids for all types of nervous system, and any sort of nerve related issues. This herb can be useful for conditions like neuritis, sciatica and chronic inflammation of the nervous system. Parts of intestine, is controlled by Vasta, and thus constipation and flatulence is effectively dealt with by using this plant. Vitex negundo (nirgundi): A small five-leaf chaste tree, this is an aromatic shrub. This is highly used in folk medicines and this is known to condition severe joint pains largely. Boswellia Serrata (Shallaki): This is known for looking after arthritis and especially the joint-knee pains. It has proven effect in pains of all kinds and the anti-inflammatory benefits. It has given a positive effect in the most dangerous disorder called arthritis. Trikatu: Trikatu effectively eliminates the formation of gas and other related discomfort linked to indigestion. Cedrus Deodora (devdaru): This is a species of cedar native. This is known to mitigate any respiratory problems. Strychnos nux vomica: This is a plant and is used to make medicines. It is used for the betterment of digestive issues, heart problems, headaches and thus due to its anti-inflammatory properties it is used in the capsule in 25gm capacity. Tribulus Terrestris: This flowering plant is used for enhancing the physical durability in a patient. Arthcare bottle contains 60 capsules. The recommended consumption is about 1 capsules daily with water. However depending on the criticality, 2 capsules can also be consumed. This has no side effect and safely up to 2 capsules daily can be used. This effective capsule starts functioning the moment it is consumed but the overall result is noticeable within 4-6 weeks time on an average. The result varies from person to person. A bottle lasts a minimum of 30 days and maximum of 60 days depending on the consumption of 1 or 2 capsule per day. 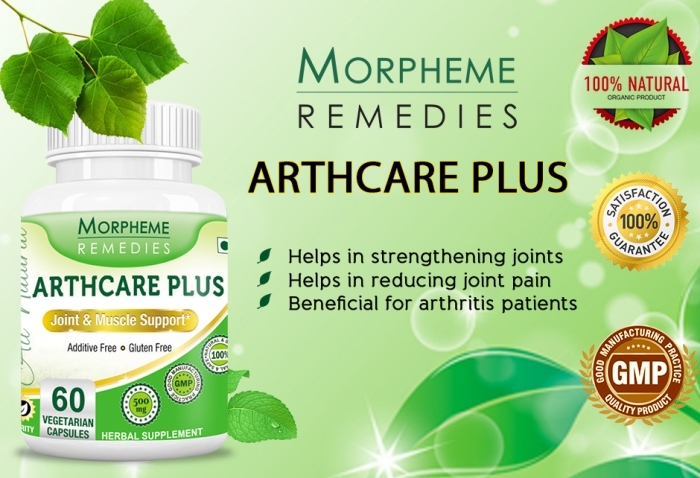 Arthcare is made of essential herbs that are considered one of the best in taking care of arthritis. These herbs are blended in the capsule in equal proportion and that effectively dissolves on consumption. Though the curing process starts as soon as consumption, however it takes about 6weeks to see significant results. The pain starts reducing. Arthcare Capsules has resolved my problem with my knees. Now I managed to run back and walk easily. Guggul (Commiphora mukul) Extract 150 mg.
Rasna Morpheme (Pluchea lanceolata) Extract 100 mg.
Shallaki (Boswellia serrata) Extract 50 mg.
Nirgundi (Vitex negundo) Extract 50 mg.
Himalayan cedar (Cedrus deodara) Extract 50 mg.
Gokshur (Tribulus terrestris) Extract 25 mg.
Purified Strychnos nux-vomica Extract 25 mg.
Arthcare is an Ayurvedic product that helps with any type of musculoskeletal disorders, pains and aches that happens due to arthritis, osteoarthritis and rheumatoid arthritis. The composition of Arthcare is done by blending some of the finest herbs that are available. Guggul is short shrub is used for decreased cholesterol synthesis in liver. Pluchea Lanceolata (rasna) is a genus of a flowering plant. It aids in the betterment of all types of nervous system, and any sort of nerve related issues. This herb can be useful in conditions like neuritis, sciatica and chronic inflammation of the nervous system. Parts of intestine, is controlled by Vasta, and thus constipation and flatulence is well looked after by using this plant. Vitex negundo (nirgundi) is a small five-leaf chaste tree, and is an aromatic shrub. This is highly used in folk medicines and this is known to condition severe joint pains largely. Boswellia Serrata (Shallaki) which is known for its positive results for arthritis and especially the joint-knee pains. Trikatu effectively eliminates the formation of gas and other related discomfort linked to indigestion. Cedrus Deodora (devdaru) is a species of cedar native. This is known to mitigate any respiratory problems. Strychnos nux vomica is a plant and is used to make medicines. It helps in aiding digestive issues, heart problems, headaches and thus due to its anti-inflammatory properties it is used in the capsule in 25gm capacity. Tribulus Terrestris is flowering plant is used for enhancing the physical durability in a patient.